Trans Siberian railroad. Transsib. Trip to Transiberian raiload. Tour to Transsib. Trans Sib. Trip to Russia, Siberia. Legendary tour. 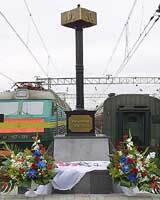 Trans-Siberian Railroad, or simply Trans-Sib (two contemporary names), or the Great Siberian Way (historical name), is a perfectly equipped railway through the whole continent that connects European Russia with Siberia and Russian Far East. 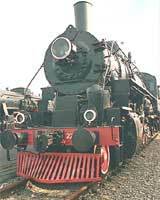 Trans-Siberian travel is a perfect chance to get acquainted with real and true Russia as it is. This travel will introduce you to unbounded open lands; you will enjoy the beauty of Ural, Siberia and Baikal region nature. This journey, which lasts about a week, won't leave you indifferent. During this trip you will pass through eight time zones, territories of 14 provinces, 3 regions, 2 republics and one autonomous region of Russian Federation. You will also cross 16 of the greatest Eurasian rivers: Volga, Vyatka, Kama, Tobol, Irtysh, Ob, Tom, Chyulym, Enisey, Oka, Selenga, Zeya, Bureya, Amur, Hor, Ussuri. The Trans-Siberian Railway also goes along the Baikal Lake shores. Unique Baikal Lake is the deepest lake (records depth 1637 meters) and the biggest water reservoir on the planet. Its shores and surroundings proudly take place among the other beautiful places of earth. One can enjoy there views of snowy mountains, transparent clear water and unique nature. Near the Baikal shores stands the only train station Slyudyanka-1, which is really unique, as the building is completely made of marble. 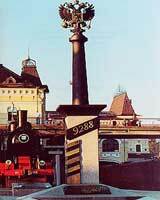 It was built in 1904 as a monument to a great labor of railway builders. Trans-Sib is also famous for its numerous bridges (the biggest one, over the Amur River, is 2612 meters in length), tunnels (the biggest, under the Amur River, is 7 km), and train stations (the most famous is Novosibirsk Station, which for some time was the biggest in the whole USSR). The actual length of the Trans-Siberian Railroad on its main way, from Moscow to Vladivostok, is over 9,288 kilometers, covering nearly all Eurasia. It's the longest railway on the planet. It comes through two continents, Europe (takes 19,1% of the whole length) and Asia (takes 80,9% of the whole length). The 1778th km of Trans-Sib is relatively considered to be a border between Europe and Asia. There, near Pervouralsk, at the foot of slight Central Ural Mountains stands a monument that symbolizes the border between two continents. During Trans - Siberian journey you will sit at the train and watch the land go by. You can find that interaction with other passengers, both Russians and tourists, is what makes trip an unforgettable experience. Travelers can enjoy stopovers in many of the Russian cities and towns along the route.